To begin this review we need to go back forty years to the publication of Watership Down. Watership Down continues to be the defining work against which we (who were alive and reading then) measure all anthropomorphic novels. Before that there were the much-loved Winnie-the-Pooh and the hilarious Toad and friends in The Wind in the Willows, but these delightful animals bore very little resemblance to the creatures of the wild. Watership Down gave us real rabbits (alongside, of course, all the 'human' qualities).The Duncton Wood series (which I only discovered in the last few years) started coming out 8 years later, and are another excellent example of the genre. I'm not so sure that the Redwall books can be classified the same - I enjoyed reading them all (loaned to me by my son's friend), but they're really humans in animal disguise. New Zealand's Philip Temple wrote Beak Of The Moon and a sequel, but I found the first one too heavy-going and didn't read more than a few pages. That was a shame, because I loved the premise.New Zealanders are getting it exactly right now! Eighteen months ago there was Ripple; now there is Aroha. "Aroha's Grand Adventure" is written for a younger reader, but that in no way makes it lesser. It's a classic tale of Journey - Aroha is an adventurous weka chick living with her family by the Grey River. She particularly enjoys human food and frequently craves the sweet and the rich flavours that, in her opinion, cannot be found in the weka's natural diet. We all know that cravings can lead us to a lack of discernment, and thus is Aroha kidnapped by a boy and smuggled back to his home on the other side of the South Island. When she's discovered by the boy's parents, they say that Aroha must be returned to our own home, and the journey begins.All animals in Aroha's world can understand human speech, but it's not reciprocal - Aroha makes comment a number of times about how the humans just don't listen her. We're pretty bad at not listening to each other, either, so she's not wrong there! But aside from their awareness of humans, Aroha and the creatures she meets behave just like regular creatures. The author has thoroughly researched animal behaviour and gives the reader a great dose of information all hidden in the text (and appendices for those wanting the cold, hard facts) And yet at no time does the adventure take second place.The writing is excellent, with lovely descriptions and a very nice use of language. In fact, I enjoyed this book so much that it has made it to the list of Books I Must Read to the Grandchildren - that's a list that isn't easy to get onto! I have always loved animal-protagonist books, but have been somewhat disappointed by the lack of birds, and more-so - the lack of female animals as main characters. It appers that in most of this style novel (with semi realistic animal behaviour), the females exist solely to be mothers or mates. Therefore, Aroha the weka was born. Or rather, hatched.You may not have heard of a weka before - they are a flightless bird about the size of a small chicken and actually belong to the Rail family. Due to their brown colouration and flightless nature they are sometimes mistaken for kiwis (despite being diurnal and inquistive and looking almost entirely different) by naive tourists. At various points in my life we have had them raid our garden and uproot plants, steal things from our tent while camping, screeching behind the tent in the middle of the night and trying to slip into our car whilst we stopped at a rest spot along the West Coast. Overall, they're birds with a whole lot of character, and also a species that is becoming increasingly rarer.Like her real world kin, Aroha is cheeky, curious and prone to getting herself into a whole lot of trouble. She's also greedy and a little bit selfish. This story is essentially a "road" trip across the central part of New Zealand's South Island. There's danger, fun and a fair amount of humour. At around 46k words, this is a somewhat lengthy tome for the young reader, but is intended for dedicated bibliophiles aged 7+. Every chapter is illustrated and the book also contains several educational appendices, a short story and a 4-page comic. 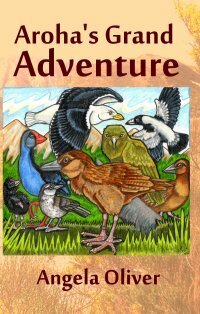 Aroha has got to be the coolest little chick and her adventure leads the reader on an adventure of their own. I personally learned more about the native birds of New Zealand by reading this book, than I have in my lifetime! I loved that I had been to many of the locations mentioned in this book, including traveling on the Transalpine to and from Greymouth, and clambering over rocks at Castle Hill. I couldn't help but imagine how a primary school class would respond to this book being read aloud to them. The children would very quickly warm to Aroha. They would probably be upset by the actions of many of the humans. They would dislike the bullying nature of the magpies, but love their language. They would be interested in the Maori given names of the birds. They would soak up the facts about the birds and the setting and the history of the area. I am gutted that I didn't know about this book before we taught a unit on 'Flight' last year. This would have been the perfect read aloud novel. The novel was perfectly paced and I adored the illustrations. Why 4 stars instead of 5? I found quite a few errors throughout the book that obviously slipped through the editing process. These distracted me from the flow of the story, which was a shame. Putting the typos aside, I can well imagine reading this book aloud to children in the future. I thoroughly enjoyed Angela Oliver's Aroha's Grand Adventure. Aroha is a plucky little weka who is taken from her home on the West Coast of New Zealand by a thoughtless child. When she is set free she has to undertake a dangerous and fascinating journey across the Southern Alps to find her way back home. The story is aimed at ages 7 and up and is not a short read — but that's not a bad thing, because it's enjoyable, and, whether you read this book to your child or they make their own way through it, it is nicely partitioned into chapters of a reasonable length which allow for 1-2 chapters per night at bedtime.Oliver has a neat writing style. The story is fully focalised through Aroha, and her limited understanding of the human world is fun, as is her more specialised understanding of the world of animals and birds. The story is very educational without being pedantic, and your child will learn a lot about New Zealand birds and the New Zealand landscape with all its flora and fauna. There are many clever little touches for the adult reader to enjoy, such as the magpie's Australian slang and the differential dialects of various bird species, as well as historical and cultural references.Aroha learns about the indifference, the threat and the kindness of human and animal strangers and takes it all in her stride. She knows who she is, what she wants, and is not afraid to go after it. She sticks up for herself and others, and children will love her practical point of view and will relate well to her obsession with food. Best of all, Aroha's journey makes her famous! Whether this story is a starting point or a refresher on New Zealand's natural world, history, geography and culture, it is bound to be a pleasant read. Highly recommended. A clever, thoughtful and lovely adventureWhen the real world becomes just too much, dive in to the world of Angela Oliver, peopled not by people but by animals.Aroha’s Grand Adventure tells the story of Aroha, a young and greedy weka chick and is a great read for years 7 plus. Wekas are a native New Zealand bird, and there is are useful appendices at the back which explain about the birds, language and geography of the world where Aroha has her adventures. Greedy for yummy human food, she strays too far and is captured by a naughty human boy called Johnny. Locked in a cage with a kind chinchilla called Beauty, she longs to escape and gets her wish when the human adults free her. Now her adventurous journey really begins as she tries to return to her home, Grey. She encounters a series of other creatures such as the vicious Whiteback Gang, a human conservationist, campers, keas and plenty more. She encounters trains, earthquakes, a raging river and throughout it all, she is, as she says herself, indomitable. A fun read!What I especially loved was the language – Oliver writes from the bird’s point of view. A piece of material “spread open its wings and floated down” instead of just being dropped. A book to make young readers (and old!) think and learn about birds and their world without realising we are being taught! I thoroughly enjoyed this adventure story about Aroha the weka and her journey from one coast of New Zealand to the other. Aroha is a smart and plucky chick who loves sweet food and collecting "shinies". Her nosey nature gets her into trouble and she finds herself "chicknapped" and has to find her way back to the Grey. On her journey she meets many other birds - from the nasty magpie gang, to the cheeky kea, as well as other animals. Humans also feature - and not always in the best light, sometimes helping her and sometimes hindering. The writing is very engaging and well paced and there is a nice dose of humour with some of the dialogue as well. Great illustrations throughout the book will appeal to younger readers. I found the footnotes (several appendices explain further about the many bird species that feature in the book as well as historical events and geographical descriptions) a little distracting but that is a small gripe. Overall this was a fun read. I normally don't enjoy anthropomorphic novels but Aroha stole my heart and I found this an enjoyable read. I am currently reading outloud to my 7year old. Ever wondered about our various native birds, how they might talk and act, well this is a fun book that gives some fabulous ideas as to what they may be thinking, how they would talk if we could understand them etc. Aroha is a Weka who has an appetite for human food and one day this gets her into trouble, she is snatched from her home in Grey and must work her way home.This is a lovely and well written book. It was easy to imagine Miss Aroha and all the birds that she meets on her journey and I could see these birds acting that way in real life. For those who may not know who all the birds are there is a section at the end of the book to give a quick summary not only on the different birds in the book, but also the places in New Zealand the Aroha travels through and a little bit of our history.I think that this is a great book to read, mostly as it's a New Zealand book through and through (I'm allowed to be biased, right?) but it's a lovely story about a plucky young weka who simply won't give up till she's back home. Fun! I learned a lot about birds and the way they see the world. Angela Oliver - Angela Oliver, "LemurKat", is an author and illustrator. She loves cute and quirky, weird and wonderful, wildlife, and they often find a way to creep into her stories. Angela Oliver has a BSc in zoology and psychology, and enjoys adventuring around the world: visiting such places as Australia, Hawaii, and Madagascar. She resides in the garden city of Christchurch, New Zealand.Angela Oliver has two novels to her name: "Aroha's Grand Adventure", an animal adventure story set in New Zealand, and "Fellowship of the Ringtails", the first in the series described as "epic fantasy, with lemurs". She does not tend to write human characters, favoring the challenge of non-human protagonists.Her miniature works of art can be found in private collections around the world. Angela Oliver has also created the ZooTrophy trading card game and the New Zealand Naturally Tarot deck.